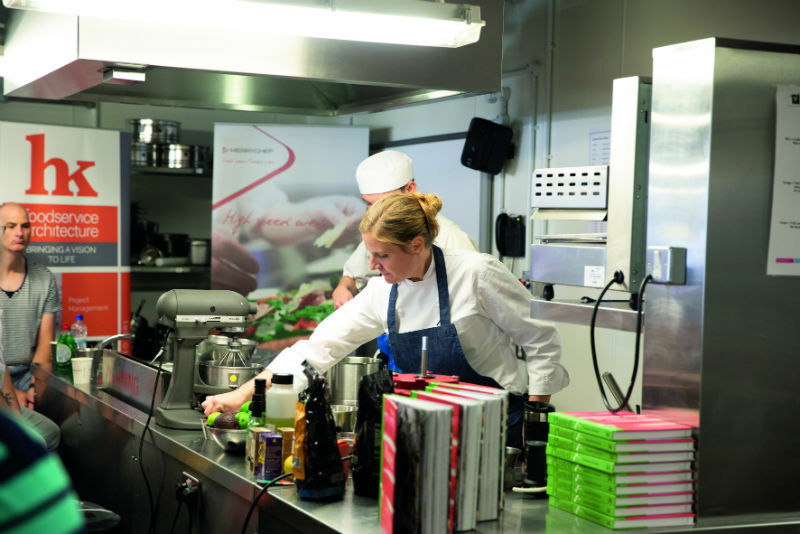 The annual Skills for Chefs conference has once again taken place at the University of Sheffield. The opening event, An Evening with Raymond Blanc OBE, saw the celebrity deliver a passionate speech. “He focused not only on excellence within his own kitchen, but also on the need to improve working conditions across the whole industry,” said David McKown, Director of Skills for Chefs. The interview was facilitated by Joe Hurd, a talented chef and presenter who is engaging, humorous and highly skilled in this role. 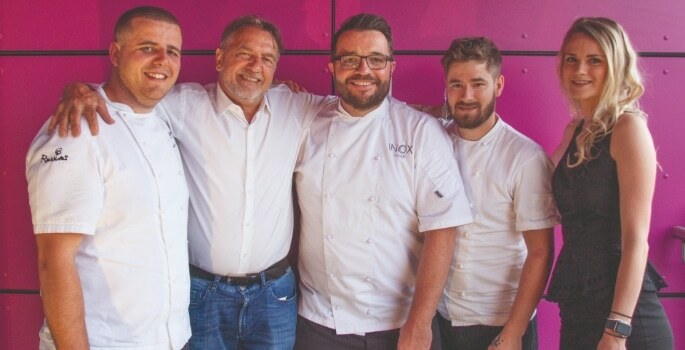 The evening also featured a special dinner created by Joe Berry, Head Chef at Inox, Tom Lawson, Chef Patron of Rafters and Luke French, Chef and Director of Jöro Restaurant. This trio of celebrated Sheffield Chefs served a fantastic range of eclectic dishes that were well received by their peers. The menu featured Moss Valley pork, Scottish salmon, Herdwick lamb, Little Mester cheese and the local condiment Henderson’s Relish. The conference continued the following day at The Sheffield College with delegates attending five different masterclasses and a key note address from John Williams MBE, Executive Chef at Ritz, London. The presentation from Michelin-starred Robert Ortiz from Lima, focused on Peruvian cuisine. Robert demonstrated the process of making classic ceviche with cod and scallops. The flavour profiles of these dishes matched the beautiful presentation and Robert was a very engaging presenter. Robert shared his in-depth knowledge of Peruvian cuisine and his recipe for tiger’s milk with fellow chefs. Lisa Goodwin-Allen from Northcote was another highlight for the delegates and her talent for delivering a very informative masterclass was applauded by all delegates. Her three dishes included free-range duck with barley and beer, wild seabass, young garden leeks, charred lettuce and iron coss and a dessert of CasaLuker chocolate, smoked hazelnut praline and salted sheep’s milk ice cream. The session was full of creative and excellent flavour profiles from the Michelin-starred chef. The conference also took the opportunity to look at current trends and the growth of veganism. Chantelle Nicholson, Chef Patron of Tredwells, delivered an outstanding series of masterclasses on plant-based cuisine. Chantel is also the Group Operations Director of Marcus Wareing Restaurants and she has just released a great book called Planted. The classes featured kohlrabi ravioli with pea and avocado guacamole in addition to dark chocolate mousse with passion fruit and chamomile. The conference also welcomed Andy Toh Chye Siong and Lai Min Wei who had flown in from Hakkasan in Dubai to present a series of masterclasses in modern Cantonese cuisine. An authentic gas-fired wok burner was installed for their sessions in order that ‘wok hei’ could be demonstrated. ‘Wok hei’ translated into English means metaphorically the “breath of the wok”. Creating ‘wok hei’ is used as a measure of the Chinese chef’s skills and these chefs have spent years perfecting the art. The session also made great use of living ingredients supplied by Koppert Cress and the dishes created included osnanthus wagyu and the signature Hakkasan duck salad. In the pastry kitchen, Gary Maclean, Senior Lecturer from Glasgow City College and winner of MasterChef The Professionals in 2016 presented a series of enlightening classes on CasaLuker chocolate. All delegates had the opportunity to taste his amazing and colourful ‘CasaLuker nevado bar with blood orange jelly and Dorado Pamela ganache”. The final keynote session was the interview with John Williams MBE, Executive Chef at the Ritz London facilitated once again by Joe Hurd. John took the delegates on an amazing journey through his career and weaved in some great examples on the role of the Executive Chef. It was fascinating to learn about essential leadership skills in addition to his knowledge on haute cuisine. Haute cuisine being that offered by ‘high-level’ establishments – dishes like canard à la presse and poulet en vessie were described by John in great detail. The session was motivating and inspiring for all delegates. The conference closed with a spectacular gala dinner in Firth Hall created by a team of chefs from The University of Sheffield and Sheffield College. The gala dinner also hosted the presentation of awards for UK Young Restaurant Team of the Year 2018. The overall winners were North Warwickshire and Hinckley College and their prize is a study trip to Colombia sponsored by MSK.